The menu at Petra and the Beast changes with the seasons and the availability of ingredients, but this board is a mainstay and a must-try. When Misti Norris is in the kitchen, she is part scientist, part visionary, pushing boundaries with her earthy and innovative dishes. Formerly at Small Brewpub, the James Beard Award-nominated chef opened Petra and the Beast in a converted 1930s gas station on Haskell Avenue earlier this year and unveiled a menu based on four themes: farm, forage, fermentation, and fire. 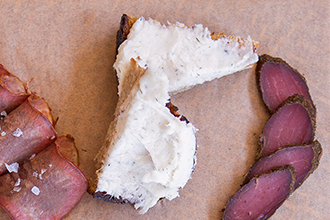 Norris’ dishes change weekly depending on the seasonality and availability of ingredients, but this charcuterie board is a mainstay. 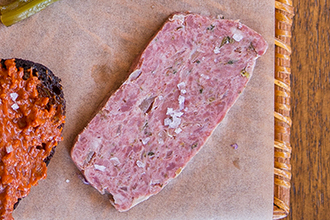 Red Wattle pork sirloin—from Chubby Dog Farm, a small organic farm in Grapeland—is cured for five days with garlic and koji (an Asian fermenting catalyst made from beans or grains). The meat is smoked for six hours and cooled before it’s sliced. 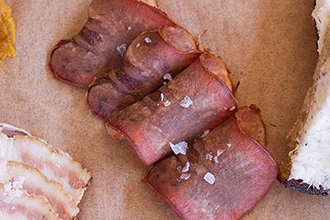 Sourced from 44 Farms in Cameron, the tongue is cured for seven days with salt, brown sugar, paprika, and garlic, then smoked for six hours. 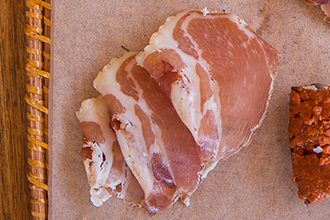 Norris uses a Red Wattle and Mangalitsa mix of leaf lard from Chubby Dog. The highest grade of lard, it is whipped with sake lees (sediment left over from sake production), garlic, dill weed, and chicken katsuobushi—a poultry rendition of the dried bonito flakes used in Japanese cooking. The chicken is from Cartermere Farms in Celina. Berkshire pig shoulder, from De Leon’s Four U Farms, is cured with koji, allspice, cloves, chile de árbol, cayenne pepper, and garlic. The meat is cured for two weeks, rinsed with red wine, and hung for six to 12 months, depending on its size. 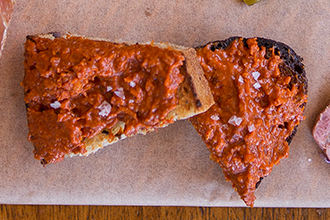 Norris grinds Red Wattle pork and mixes it with garlic, smoked paprika, Calabrian chiles, and toasted caraway. The pork is set overnight and then smoked for approximately four hours. It’s whipped the day of. 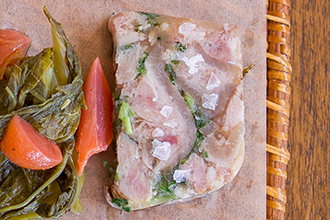 Red Wattle pig shoulder from Chubby Dog is braised with garlic and onion, then set with pork gelée, chopped green garlic, and chives. 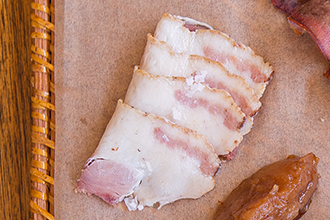 Ground Red Wattle belly is emulsified with salt-preserved wild onion, sorrel, and clover. It’s set overnight and cooked in a water bath, and then pressed for 24 hours under a loaf pan before it’s sliced.